Benjamin Godard's opera Dante rarely heard but causing quite a sensation. In January this year, it was heard at the Prinzregententheater, Munich, and later at the Opéra Royal de Versailles, Paris, and broadcast throughout Europe. What a delight! This was the first performance odf a modern edition of the orchestral score, produced by the Palazetto Bru Zane. Godard (1849-1895), like many French composers, resisted Wagner and the cult of Bayreuth. Dante (1890) is lyrical drama in the French tradition, a fin de siècle descendant of Massenet, Thomas and Gounod, though not a precursor of Debussy, whose Pelléas et Mélisande was to premiere only seven years after Godard's early death 12 years later. Dante and The Divine Comedy are so well known, there's no point rehashing them here. Godard's Dante , though, is also interesting because it suggests a connection between Dante and Goethe's Faust. 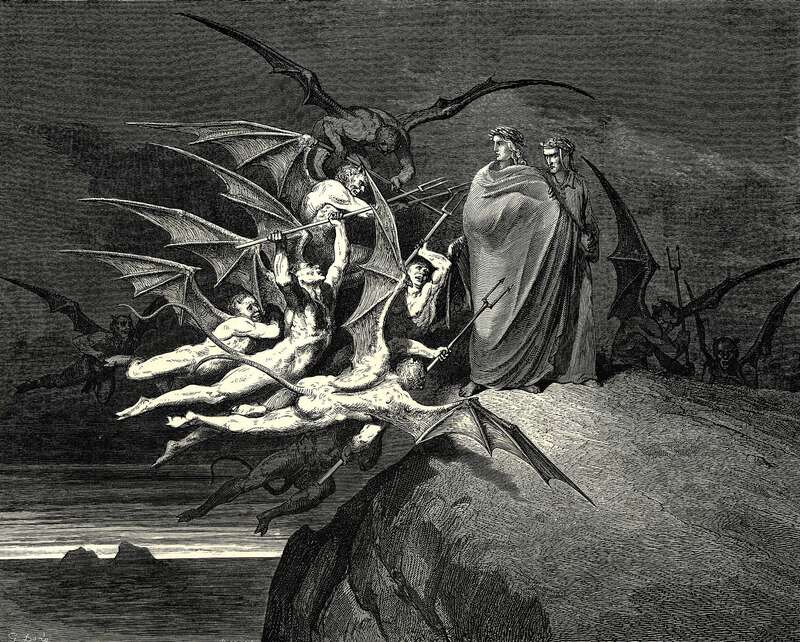 In this Dante we can hear echoes of Gounod's Faust, of Berlioz's The Damnation of Faust and even of Boito's Mefistofele: All are part of an interest in the Gothic Imagination and its fascination for the demonic and macabre beneath-surface lushness. One might also consider Baudelaire Les Fleurs du Mal and the etchings of Gustav Doré, which I've used here. While Godard certainly can whip up a beautiful storm, helped by the exceptionally good performance, Véronique Gens is easily the finest specialist in late French Romantic repertoire,and brings the very tricky role of Béatrice to life with the lustrous timbre of her voice, and the poise with which she negotiates the range in the part. No wonder Dante would go through hell for her! Béatrice (and Gens) so dominate this opera that it would be hard to imagine a performance without the beauty of Gens's singing. The rest of the cast is superb too. 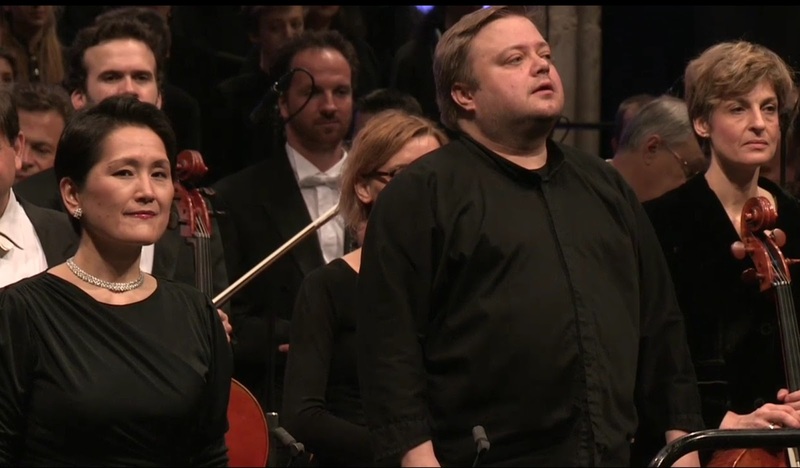 Edgaras Montvidas sings Dante, Rachel Frankel sings Gemma (Béatrice's friend), and Andrew Foster Williams sings the Shade of Virgil. 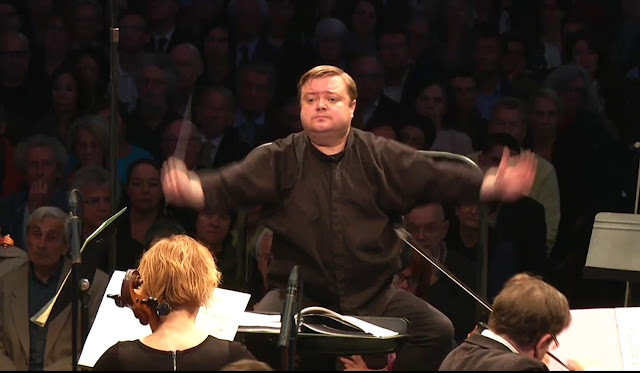 Ulf Schirmer conducts the Bavarian Radio Orchestra. All too often rarities like Dante are spoiled by mediocre, lacklustre performances by conductors who rely on the fact that audiences don't have a point of reference, and fall for the safe and bland, which doesn't do the music justice. Godard isn't a genius, which is all the more why this performance is so good. Ulf Schirmer isn't the kind of conductor who gets away with things because he has no competition. Everything I've heard him conduct is geared towards the specifics that make a composer individual. Not all that many condutors have that gift. Palazzetto Bru Zane is to be congratulated on going for the best, without compromise. This Godard Dante is being released on CD, An essential purchase, I think. Please read the notes prepared by the Palazzetto Bru Zane, HERE. probably the best source so far on the composer and on the opera. I quote "Godard’s opera, composed in 1890, skilfully juxtaposes political developments – crowd scenes in Florence and the feud between Guelphs and Ghibellines – and the expression of medieval courtly love. In the opera Gemma, a young girl married to the protagonist out of duty and then abandoned, becomes the close friend of the beloved woman, Beatrice, of whom she is also the secret rival. The most remarkable aspect of this opera, though, is the insertion of a ‘Vision’, a kind of synthesis of the Divine Comedy set to music. Act three thus ranges between an imaginary Hell and Paradise, with sections bearing titles such as Apparition de Virgile Chœur des Damnés, Tourbillon infernal, Divine Clarté, and Apothéose de Béatrice . Godard here appears at the peak of his melodic inspiration and his overall compositional mastery, in a style that swings between Gounod and Massenet. The vocal quintet called for in the opera perfectly captures all the heroic and expressive potential of singers well-versed in Wagner and Verdi." English Baroque opera at St John's , Smith Square, ready for booking now. The English baroque style is unique, more "classical" than exuberant; southern forms, yet connected to contemporary theatrical values. St John's, Smith Square, is a gem of British baroque architecture, an ideal place in which to enjoy English baroque music. Henry Purcell Dido and Aeneas on 29/9 with the celebrated La Nuova Musica, led by David Peter Bates. Major headliners - Dame Ann Murray will sing Dido and George Humphreys will sing Aneas. Again, a very good cast. What's more, with typical adventurous La Nuova Musica flair, this performance will be illustrated with dancers, choreographed by Zack Winokur. This should be one of the highlights of the season - book early ! Thomas Linley's Lyric Ode: on the Fairies, Aerial Beings and Witches of Shakespeare features in Bampton Classical Opera's second concert on 15/11. A glorious piece,, vividly dramatic. It's being paired with excerpts from Georg Benda's Singspeil Romeo and Juliet,which Bampton Opera did in 2007. Gilly French conducts the Bampton Classical Players and a cast that includes Rosemary Coad, Caroline Kennedy, Thomas Herford and James Harrison. Another highlight! The Early Opera Company, conducted by Christian Curnyn, makes a welcome return to St John's on 18/11 with Handel's Serse HWV40 , this time with Anna Stéphany, Rupert Enticknap, Callum Thorpe and Claire Booth, among others. Fromental Halévy La Juive at the Bayerisches Statsoper, Munich last night - horribly, frighteningly pertinent to events this week - and last week, too, when MP Jo Cox was murdered. Yet already Farage claims "no shots were fired" in his adventure. Now it seems that the whole country has been murdered, too, poisoned by an eruption of dishonesty and sheer bloody-minded pettiness. This isn't "democracy" but a spilling out from the hell of the Universal Troll. In La Juive, everyone gets destroyed, whatever their faith, whatever their station. This production, by Calixto Bieito, pulls no punches. No comic-book costumes to distance us from the brutal message. These terrible things can happen anywhere, at any time and on all sides of the political spectrum. No one is immune. Just as conductors have individual styles, so do opera directors. Bieito is the one to go to for insights on social issues. His Carmen (more here) highlighted the cruel objectification of women. His Aida reminded us that there are slaves in modern society : we call them the underclass, especially if they're the wrong race. And his Fidelio (more here) was so powerful that audiences couldn't figure it out, though it was a lot truer to Beethoven than they realized. Bieito shocks, but he does so for constructive purpose. So we don't see a palace, but that kind of luxury can hide the brutality within? Instead we see hard "stone" walls and massive columns that lean down oppressively over proceedings, a subtle reference to the Gothic arches in the stage directions. Roberto Alagna, singing Eléazar, looks anonymous, moving furtively, almost in disguise behind hat and dark glasses. As a hunted refugee would. When he does start to sing, however, the glory of his voice asserts itself, conquering the grimness around him. Alagna is an idol but here he's a true artist. Eléazar shines, not the "star". He's a decrepit old man but what he represents is something finer than what the Emperor and Cardinal de Brogni stand for. Aleksandra Kurzak sings Rachel,. She's dressed in green, so she stands out from the hard black and white around her. Green, too, symbolic of freshness and renewal. When she's killed. a lot dies with her, including the Cardinal's soul. John Osborn sang Prince Léopold and Vera-Lotte Böcker sang Princess Eudoxie. The simplicity of Bieito's set concentrated attention on the human drama , and on the music. Bertrand de Billy conducted well, but the singers - especially Alagna - were able to dominate. Last night someone who doesn't have prejudices about what opera "should" be, wondered why Bieito is considered controversial. A perceptive observation, since Bieito's approach goes straight to the heart of the opera, no messing about. This was an overwhelming experience, so strong in fact that I couldn't bring myself to write about it, in view of the events of this weekend. But read Opera Traveller's account HERE. he says it so well. A petty criminal, peruses the comics. "Easy Pickings", he thinks. But "easy pickings" and easy answers don't mean taking control. London Belongs to Me now seems terrifyingly prophetic. The film begins in the London of 1938 : social change is already underway. Once grand terraces are now multiple occupancy rooming houses, with lodgers who can't meet their rents, or feed their gas meters. The landlady, Mrs Vizzard, lives in grand delusion, still dressed in Edwardian garb, her home cluttered as if in Victorian time warp. A new lodger (Mr Squales) turns up. He's so unnatural that she thinks he's an actor. He is, but not quite in the way she thinks. Mrs Vizzard hosts seances for dodgy mediums who claim to commune with the dead and foretell the future. Think on that. It's Christmas, and Mr and Mrs Josser, daughter Doris and Uncle Henry are having Christmas dinner. Fellow tenant Connie fakes a faint to con a free feed. The family discuss the Munich Agreement. As he cracks a walnut, Uncle Henry says "If we don't wake up, Hitler will have us like this!" "For goodness sake", says Mrs Josser, "Put on your paper hat and enter into the spirit". Percy the flashy young spiv takes Doris to a dodgy night club, which gets raided. Percy escapes but Doris gets caught. But the policeman, Sgt Bill Wilson, who takes her details, doesn't note them in the right place, because he fancies her. Hoping to make enough money to start a business, Percy steals a car. Spotting the police, he panics. The ex-girlfriend who forced him to take her for a ride is killed, though it's not exactly clear how and by whom. Even Mr Squales worries that he might have been involved, without "being himself". .
Mrs Vizzard learns that Mr Squales has been faking photographs of ghosts at seances, and kicks him out. "I've no use for frauds and common adventurers". Squales overhears Sgt Wilson order Percy's arrest and uses this to have a trance "revelation" . When Percy is picked up, Mrs Vizzard is fooled all over again. In prison, Percy has graphic nightmares. "I never did it!" he cries. Mr Josser uses the money he's saved for a cottage in the country to hire a defence lawyer for Percy, even though he doesn't like the lad, because it's the moral thing to do. Mr Squales turns up for the prosecution. It seems the girlfriend was killed by a "blow to the head" though she was hit by a passing car after falling out of Percy's car. Percy is condemned. Won over by Mr Josser's generosity, Uncle Henry organizes a mission to save Percy, and raises a petition that gets so many names that it has to be carried to the Home Office pushed in a pram. Wonderful shots of the procession of protestors crossing Westminster Bridge in pouring rain ! Big Ben booms. It's 5 pm. Are they too late ? But the newspapers announce that Percy's been reprieved. It's August the 31st, 1939...; what happens next ? Air raid sirens. Mr Squales, now married to Mrs Vizzard, says the spirits tell him the war will soon be over. Mr and Mrs Josser are staying in London, despite the war. They wouldn't leave Doris. The film ends with a shot of Dulcimer Street. "They certainly are fine houses" says the narrator. So are some of the people within. London Belongs to Me was made by Sidney Gilliat in 1948. It stars Richard Attenborough, then aged 25 though he looks even younger. It's long been one of the great classics of British cinema, but after the Brexit debacle, perhaps it means even more, now. Ralph Vaughan Williams and Friends Weekend at St John's Smith Square, a glorious three-day celebration of British music. This follows on the success of previous SJSS weekends devoted to Schubert and Schumann. Curated by Anna Tilbrook, the RVW/SJSS weekend features The Holst Singers, James Gilchrist, Philip Dukes, and Ensemble Elata. The Weekend runs from 7th to 9th October, but get tickets soon as they will sell fast. There's no clash with the Oxford Lieder Festival which starts the following weekend, this year featuring Schumann. Saturday 8th 4 pm : The Folk Connection Quilter I will go with my father a-ploughing, Percy Grainger : Molly on the Shoree, RVW : Along the Field, Six Studies in English Folk Song, Winter's Willow and Linden lea, Rebecca Clarke : I'll bid my heart be still, Grainger: Handel in the Strand. James Gilchrist and Anna Tilbrook at the Wigmore Hall, London, with Sally Beamish's West Wind. Gilchrist has been one of the most determined advocates of English song, almost from the beginning of his career. Although his core repertoire is built on solid foundations of Handel, Purcell, RVW, Britten, and especially Gerald Finzi of whom he is a great exponent, Gilchrist has always made a point of promoting composers who should be more in the mainstream, like Hugh Wood, Lennox Berkeley and John Jeffreys and others whom he's performed live but not recorded. . By commissioning Beamish, one of the most prominent British composers for voice, Gilchrist is again making a valuable contribution to British music. Rolling, circular figures introduce Beamish's West Wind , the voice entering from a distance as if it were being blown in by the "pestilence stricken multitudes". Soon, though, the voice asserts itself., Gilchrist sings the words "Cold and low.....the corpse within its grave". A slow, penetrating chill descends, but, like the wind, the music changes direction, at turns capricious, then still, then rushing forth. The third section is particularly beautiful. Delicate piano figures lead into curling, keening vocal phrases that seem to hover in the air, "Lull'd by the coil of his crystalline streams". In the lower register of the piano, perhaps we can detect sonorous "lungs". Suddenly lightness returns. "If I were a dead leaf", Gilchrist sings, almost unaccompanied, suggesting fragility. His touch is delicate, yet perfectly poised. The phrasing suits his voice. Gilchrist has the strange esoteric timbre of a typical English tenor, but also direct, almost conversational naturalness. From vulnerable sensitivity to the ferocity of the last poem. "Make me thy lyre" Gilchrist growls at the bottom of his timbre. Now Tilbrook's playing flutters weightlessly, like falling leaves. "Scatter, scatter, scatter" Gilchrist sings, each word on a slightly different level. "O.. O...O " he sang, mimicking the sound of wind, the word "Wind" pitched and held so high that it floated, rarified, into air. Beamish's West Wind is quirky, underlining the disturbing undercurrents in a poem ostensibly about Nature, but too malign to be a "nature poem". I kept thinking of Peter Warlock's The Curlew, another cycle well suited to Gilchrist's style. I also remembered Gilchrist's Die Schöne Müllerin. There are hundreds of recordings, but his stood out out from the competition because it was an interpretation derived as if from clinical observation of the miller's psychology. In this Wigmore Hall recital, Gilchrist and Tilbrook included songs by Mendelssohn,and Liszt and Schumann's Liederkreis op 39. Eichendorff's poems are less overtly ironic than Heine's, which formed the basis of Schumann's Leiderkreis Op 24. but are perhaps closer to,the spirit of the very early Romantic period. After hearing this performance, I've decided to grt Gilchrist's recent recording of the Schumann song cycles on Linn. 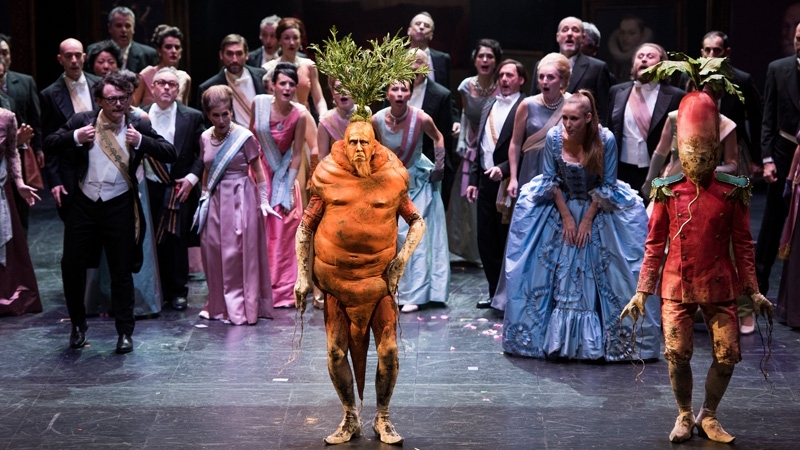 At the International Opera Awards this spring, Jacques Offenbach Le roi Carotte. and deservedly so. What a discovery! Le roi Carotte is a wildly anarchic satire, whose message is only too relevant now, in our era of "post-truth" politics where demagogues and their followers think winning is everything. The production was a sensation at its premiere at the Opéra National de Lyon on 12 December 2015. It was broadcast on France Musique, French and German TV, the BBC, and elsewhere but in the UK it seems have have raised nary a ripple of interest. Judging by the incomprehension with which Chabrier's L’Étoile was received in London this February (read more here) maybe one could conclude that London audiences don't get opéra bouffe, or they'd have realized that King Ouf's very name springs from the word "bouffe". In other words, puffed up, wicked, lively, as delicious as whipped creme. Offenbach's original, first heard in 1872, was an over the top extravaganza of 22 scenes, singing, dancing, music and comedy sketches, lasting more than six hours, which definitely wouldn't go down well with modern audiences. Bouffe and operetta aren't quite the same thing. This new edition was prepared by Laurent Pelly, a man of the theatre who knows the genre extremely well, and indeed specializes in French theatre and opera. Remember his Ravel L'enfant et les sortilèges at Glyndebourne? Read an interview with Pelly here. Pelly has directed a lot of Offenbach : La belle Hélène Les conte's d'Hoffmann (twice) , La Périchole and La Duchesse de Gérolstein. Le roi Carotte is magnificent on its own terms, but a bit of background doesn't hurt. The Overture, for example, though it's pure Offenbach, has the panache of the military choruses in Gounod's Faust. This may be no accident, since going to war meant less to Goethe than it did to Gounod whose audiences gloried in Napoleon III and victories in the Crimea. When Le roi Carotte premiered, the irony would not have been lost on Offenbach's audiences, who only the previous year had witnessed the Prussian invasion and the Paris Commune. In Le roi Carotte, the drunken student chorus is even more prominent, complete with staccato riffs to which beer mugs can be rhythmically beaten. Hedonism rules! But "Don't knock it" sing the chorus : it can all evaporate in an instant. Meanwhile back in the palace le roi Carotte is besieged by sycophants and salesmen - from Persia no less - but being down to earth, he prefers soup to silks. Fridolin and Cunégonde meet. "Moi! Toi? haha haha " they duet, the orchestra laughing along. Coloquinte appears and sends Fridolin, Robin-Lauron and Rosée-du-soir underground in puffs of smoke, the journey described by the orchestra, playing in darkness. Here, insects rule. "Gloria nobis", they sing as they educate Fridolin and friends about their underworld. The bugs swarm upwards. Coloquinte can't cope. Le roi Carotte and his radish knights get sick. "Ça, Le Stratège ", to use bugs to weaken veg! Crops fail, prices rise and the populace in the market place revolt. At last they call the king a carrot. Kiribibi stands astride a barricade of vegetable crates and sings of Liberty. The people recognize the sounds of an approaching army. Fridolin is restored. Le roi carotte doesn't go to the guillotine. He's shredded in a vegetable press. An exceptional opera, an exceptional production and a very good cast, details here. Chances are it will never come to the UK, but let's hope it will be appreciated on DVD. In the reedbeds around Snape, Aldeburgh, Pierre-Laurent Aimard played Olivier Messiaen Catalogue d'Oiseaux to greet the dawn chorus. 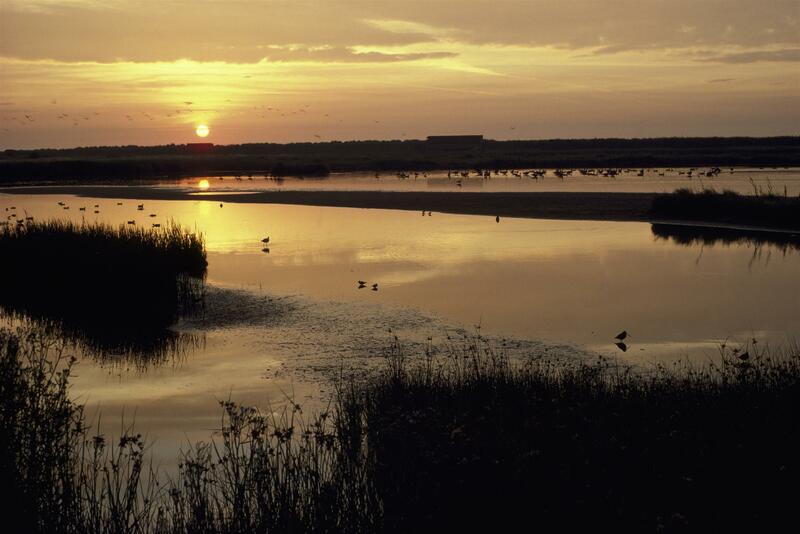 RSPB Minsmere, whose photo this is, is one of the finest nature reserves in the UK, home to nearly 6,000 species. The Alde River estuary is virtually untouched in many places, it's an area of outstanding beauty, and a haven for year-round residents as well as migrating species. Aimard's Catalogue d'Oiseaux is a metaphor for what the Aldeburgh Music Festival stands for. Long may it be protected from exploitation and vested interests. Long may it stand for pristine excellence. Messiaen was a deeply spiritual person, so for him birds were part of God's creation. Not for nothing that his great opera was Saint François d'Assise, the humble saint who embraced simplicity and talked to the birds. (Read more about the opera here) And so I am up with the birds, too, with darkness outside, listening quietly. An incredible haven of peace in a world that's become insane with extremist delusion. This morning Aimard played Le Traquet stapazin (black-eared wheatear), La Bouscarle (Cetti's warbler) and Le Traquet rieur (black wheatear) Never mind that these aren't the exact same birds at Aldeburgh. Messiaen's music is music, transcribing and adapting the spirit of the birds. It's 5 am now, and the music is over, but I'm going outside to sit in the garden for a bit. The sun's not quite out yet. It will be cold. But it's so beautiful. BBC Radio 3 is broadcasting all four of Aimard's Catalogue d'Oiseaux concerts live (and on demand) plus other features on connected themes. Next concert 1pm, then 730pm and 11pm. Link HERE. 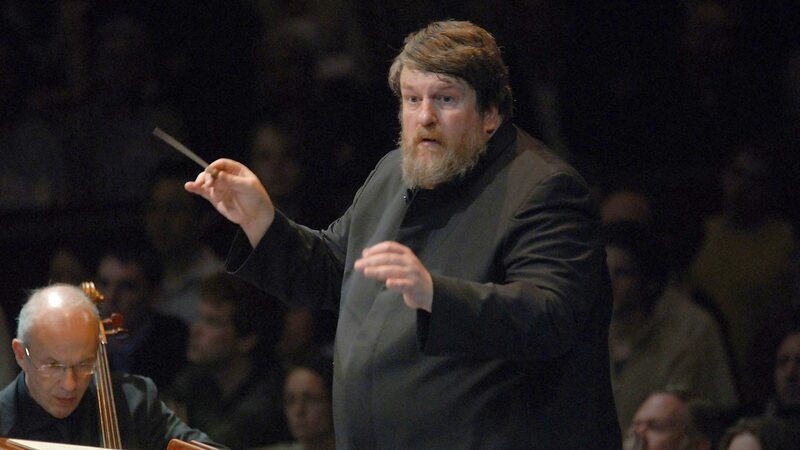 Aldeburgh and Oliver Knussen, so closely connected that it's always an occasion when Ollie conducts the BBC SO at Snape. Ostensibly, the theme of this programme commemorated the First World War, but frankly it didn't need an artificial angle. In true Britten, Aldeburgh and Knussen tradition, this concert was forward looking and adventurous, working very well on its own musical terms. Britten and Aldeburgh have always been outside the mainstream of British tradition, so Elgar isn't heard much here, and the oratorios and major works don't suit the Maltings. Bach, however, is an Aldeburgh staple, since Britten passionately believed in links between the baroque and the modern. So for a change, Elgar's transcriptions of Bach's Fantasia and Fugue in C minor. Bach often gets tellingly transcribed in every era, so transcriptions offer a glimpse into the transcriber's style. Elgar's Bach is stately, an ocean liner rather than a doughty skiff. Not top-notch Elgar but pleasant enough. It served, however, to magnify the originality of George Butterworth to whom Ralph Vaughan Williams dedicated his Second Symphony, an acknowledgement that, without Butterworth's vision, RVW might not have achieved so much so soon. Butterworth's A Shropshire Lad is based on the same Housman sources that inspired both Butterworth and RVW's wonderful song cycles. RVW orchestrated his songs, but Butterworth created something entirely new for his orchestral Shropshire Lad. You can recognize echoes of the songs, but the whole is a quasi-symphonic work in its own terms, sophisticated ideas expressed with clarity and originality. Because Knussen doesn't do mainstream "English" music, he approached Butterworth without baggage. This Shropshire Lad sounded remarkably fresh. Definitely not "cowpat school", but a contender for inclusion in the new age of music that was fast developing all over Europe at the time the piece was written. What might British music have been had Butterworth survived the war? With this imaginative Butterwoth still resonating in the mind, Gary Carpenter's Willie Stock didn't have much chance. Even on relistening to the broadcast, it's a work that is wonderful in concept, though less so in execution. Willie Stock was an ordinary soldier, killed in the trenches, so Carpenter adapts popular song of the time, deconstructing and fragmenting the tunes, just as the men in the trenches were blown to bits. It's thoughtful, and one feels close to poor Willie Stock but it might be best heard as part of a documentary, rather than a concert piece. Elliott Carter's Sound Fields replaced at short notice a Carter work for baritone and orchestra. Sound Fields was born when Knussen and Carter were having lunch together at Tanglewood in 2007. Since Carter wrote so well for string quartet, it’s surprising that this is his first work for string orchestra. Yet, despite the larger numbers involved, it’s diaphanous, a gently wavering sequence of chords. A single chord is played by twelve sub-groups in the orchestra, achieving startling density by simple, elegant means. Sound Fields is slow and smooth, the chords gradually enfolding out of each other. It starts with slow timbred cello, evolving towards a simpler, barely audible final chord, also cello, that seems to evaporate into nothingness. All in barely four minutes. Charlotte Bray is an Aldeburgh regular, and good, so her Stone Dancer was eagerly anticipated. It was inspired by Henri Gaudier-Brzeska's Red Stone Dancer (1913-14) when western art was learning from non-western "primitive" art. Picasso, Braque, Stravinsky, Diaghilev, and more. Thus the figure of a dancer, whose métier is fluid movement, depicted as solid, inanimate object. What comes over, though, is physical presence and strength. Thus Charlotte Bray's Stone Dancer moves in a series of smaller movements, each held long enough that we feel the force behind the ideas before moving on. This reminded me a lot of Rebecca Saunders's monumental sculptures in sound, which come vividly to life in performance. British music is most certainly alive and well, without a whisper of twee. And so to Alban Berg's Three Piece for Orchestra Op 6 from the same period as Gaudier-Brzeska's sculpture. Again, the idea of dance and physical forces expressed through music. In the first "piece", the Praeludium, the orchestra growls, as if invoking primitive powers. The central piece is even called Reigen referring to dance. Ländler and waltzes appear fleetingly, caught up in the swirl of the larger flow, as if the orchestra was like time itself, pulling things along in its wake. Thus the wild finale, where dance figures coarsen into march: the idea of movement made brutal Knussen and the BBCSO defined the sparkling touches in the piece so well that the contrasts with low winds, wailing brass and timpani felt savagely disconcerting. Tomorrow at the Aldeburgh Music Festival is Hardanger Fiddle Day. Julian Anderson's Ring Dance for two violins (1987) will be heard at the Jubilee Hall, together with pieces played by Hardanger fiddle master Sivert Holmen. The Hardanger tradition comes from the mountains of western Norway. In rural areas, social occasions like weddings brought isolated communities together, thus helped shape regional culture. Hardanger fiddlers played for dances: thus the strong rhythmic beat and repeated patterns. Hardanger music is joyful, even athletic - some forms of Norwegian dance resemble acrobatics. Yet Hardanger music is also plaintive, with an overlay of keening melancholy. 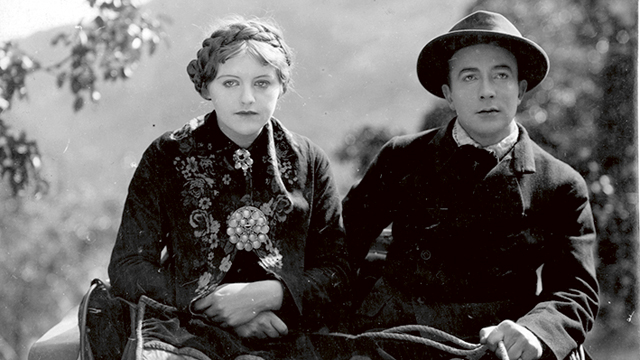 That curious blend of youthful vigour and sorrow pervades Brudeferden i Hardanger, a film from 1926, directed by Rasmus Breistein, who was himself a country fiddler and later learned the Hardanger style. The film is based on at least one novel, but also explicitly connects to one of the most famous paintings in Norwegian art, Brudeferd i Hardanger, (1848) by Tidemand and Gude. The painting shows a boat sailing down a fjord, surrounded by mountains. On the boat is a bride leaving home for a supposedly happy future. In the film, there's a shot in the film which almost exactly replicates the painting. Presumably those who watched the movie made the connection. Breistein's film, though, starts out first with another scene in which a boat carries a family, forced by poverty to emigrate. Marit refuses to go with her parents, but runs up the mountainside, watching the ship head out to sea. The family look back, grimly, at the mountains, not knowing what will lie ahead. Marit stays because she's secretly in love with Anders. Anders is leaving, too, but gives Marit his mother's Sølje, a traditional wedding brooch. She assumes he'll marry her but four years pass without a word. Next we see a bridal procession, the Brudeferd. The soundtrack, added when the film was restored, features Hardanger fiddle played by a named master, though otherwise the music is mostly Grieg. It's a big wedding, with at least a dozen boats, being rowed down the fjord, fancier than in the painting. The bride is rich, wearing a jewelled crown, and elaborate traditional dress. Wonderful shots of the wedding party, with the women in starched aprons and headresses. Hardanger embroidery ? Hardanger fiddlers, of course. But who is the bridegroom ? Marit gets Anders alone and scolds him for marrying money. Marit quits her job in the house of the judge and goes to work with a crofter in the mountains. Loyal Tore, who has loved her all along, finds her and takes her back to Skjralte, his big farm in the valley. Many years pass, and Marit is now a rich old widow. Look at her embroidered finery now ! She's still wearing Anders's mother's Sølje. But she's bitter, her mouth hard, like a scar. Anders has fallen on hard times. His wife's money is gone, and the once rich bride is forced to peddle small goods to scrape a living. Cruel Marit humiliates the woman, who eventually dies. Fate, though, intervenes. Marit's daughter Eli falls in love with Anders's son Bérd. When her mother throws her out, she goes to live with him and old Anders in a humble hut. Another country dance, another Hardanger fiddler. Marit's son Vigleik gets drunk, goes to Anders's hovel and beats the old man up. Eli takes Anders back to Skjralte to recover, Vigliek flees to America, and Marit nurses Anders back to health. The film is beautifully shot, lingering lovingly on things like spinning wheels, bucket making, rustic houses furnished sparsely, some with simple painting on on the walls. and the laying of hay to dry on branches set in the ground. The acting is good, too, much better than in most silent film. The restoration is so good that details are given in full at the end, deservedly so. Brudeferden i Hardanger is an even more beautifully made film than Troll-Elgen (which I wrote about here) though Marit is an unsympathetic piece of work. In the photo below, we can see the simple, portable cameras Breistein's crew used, shooting on location in the open countryside. François-Xavier Roth brought Aldeburgh "through the centuries" when Les Siècles played Rameau and Ravel on Saturday, the first in a series by this most fascinating of ensembles. Roth and Les Siècles are innovative, dispensing with the whole idea of boxing music into stereotypes of period and genre. For them, music is a life force so vital that it transcends boundaries. Period performance isn't just about instruments or even style. It's a whole new way of thinking, which respects the music itself, as opposed to received tradition. In his own time, Jean-Philippe Rameau was avant garde, so shockingly different that he was lucky to have patrons in high places. Rameau changed music. Thus Roth and Les Siècles paired Rameau and Ravel, innovators across the centuries, both working on themes from classical antiquity. Time travel on every level ! Significantly, both Rameau and Ravel were writing for dance. Dancing is a physical activity, which requires co-operation. Dancers co-ordinate with music, and with each other. Rameau's music takes its very structure from the discipline of dance, with its intricate formal patterns and abstract expressiveness. In 1722, Rameau wrote the Traité de l'harmonie réduite à ses principes naturels, building firm theoretical foundations for musical creativity. The baroque aesthetic "contained the world" to borrow a phrase from Mahler, encompassing worlds beyond time and place. Rameau's Daphnis et Eglé (1753) illustrates the composer's basic ideas. It was created for Louis XV at Fontainebleau, as entertainment after days spent in the forests hunting animals for sport. This context matters. The dancers, singers and musicians act out a fantasy which has little bearing on real life. Yet it's so beautiful that it takes on a logic of its own. Think about baroque gardens, where the abundance of nature is channeled into formal parterres, though woodlands flourish beyond, and birds fly freely.This tension between nature and artifice livens the spirit: gods mix with mortals, improbable plots seem perfectly plausible. We enjoy the music as abstract art. The whole Daphnis et Eglé unfolds over 16 separate tableaux each of which illustrates a type of dance, the whole piece thus forming an intricate unity of patterns and sub-patterns. I've seen the piece choreographed which reveals the way the music reflects physical form: a wonderful experience ! At Aldeburgh, Roth and Les Siècles don't have the resources of Les Arts Florissants to hand, and also dispensed with the sections for voice, but this hardly mattered. By focusing on the purely musical aspects of the piece, they brought out its innate energy, its liveliness deriving from its origins in dance. This performance was even more muscular than when Christie and Les Arts Flo did it in 2014, bringing out the forceful, physical quality in the music to great effect. Baroque dancing, particularly before Louis XIV, was more athletics than ballet as we know it now. Like fencing, it was physical fitness for aristocrats, training the mind as well as the body. In this superb performance, Roth and Les Siècles proved, if any further proof were needed, that period performance is not for wimps ! This performance of Daphnis et Chloé was even more revealing. So often the piece is heard as dreamy colorwash, for it is so beautiful, but its foundations are much firmer. Ravel was writing for the Ballets Russe, for larger and more opulent orchestras than Rameau. Ravel's Daphnis et Chloé is a descendant of Debussy La Mer, an impressionistic fantasy, yet it is very much a work created for dance. Ravel gave more room to characterize the narrative, but the spirit of the work is deliberately alien. Thus Ravel's wind instruments and strings evoke otherworldly atmospheres. The solo parts are exquisite, suggesting pan pipes and delphic voices. . There's even a suggestion of a wind machine (though it's done by more conventional means). The offstage horns, trumpets and voices evoke mystery, suggesting states beyond mortal comprehension (that's why the singing is wordless). Yet the aesthetic of Ravel's period embraced modernity, the stylization of art nouveau, where plants, flowers and people were depicted in twirling, twining contrast, influenced heavily by art from beyond central and western Europe. As in the baroque, nature cannot really be tamed even in an era when people lived in cities lit by electricity and rode in tramcars. Fokine's angular choreography horrified audiences used to mid-19th century ballet, where ballerinas fluttered in tulle. 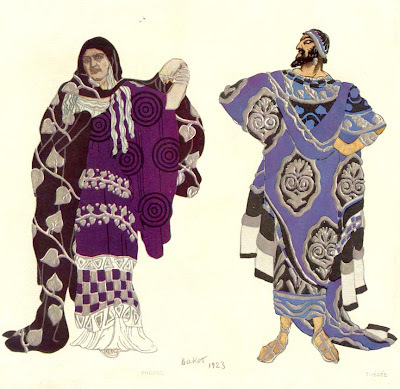 Bakst's designs for this ballet were decidedly "modern" in comparison, evoking the formality of ancient Greek art. This superb performance seemed informed by insight into the context of the piece. Roth and Les Siècles brought out the innate energy in the piece, reminding us of the angular, "primitive" style of the Ballets Russe, inspired by prehistory and ancient myth. A vivid performance, bristling with verve and physicality. Listen again here on BBC Radio 3. Alban Berg Wozzeck from Amsterdam last week, Markus Stenz conducting, with Florian Boesch, an outstanding Wozzeck. Boesch's characterization reveals great insight. This Wozzeck is far more complex than a nobody, so browbeaten that he becomes more animal than man. That's a perfectly valid approach, and one which lends itself to surprising psychological development. Wozzeck is "the common man" but the common man isn't necessarily mindless, or psychotic (as Wozzeck might well be). The natural majesty in Boesch's timbre lends itself to a portrayal as powerful as a force of nature. The intensity in his voice suggests great strength, pressures building up like magma, held in check by hard geological forces. When the tectonic plates fissure, Wozzeck explodes. When he kills, the murder is more to do with himself than with Marie. At the end we hear "Ringlien, Ringlein, Rosenkranz". Are cyclic forces destined to come round again? Or have we learned through the process of listening, that the insanity of the Doctor and the Captain is an excuse for evil ? Boesch's Wozzeck is powerful, too, because he can suggest the fragility in Wozzeck's mind, its fundamental fractures audible in the quiet moments as in the outbursts. When Boesch sings Wozzeck's brief moment of self assertion " Wir arme Leute......Geld ! Geld! ", his voice takes on a steely edge though the lines are delivered with leaden resignation. Even the Captain picks up that Wozzeck is "eine guter Mensch.... Aber er denkt zu viel, das zehrt." The Drum Major and Marie just act: Wozzeck in his confused way is trapped by his thoughts. Boesch's Wozzeck thinks, for sure, since intelligence is the hallmark of Boesch's style. He's a man for whom being superficial would be a moral affront. In the scene where Wozzeck and Andres are cutting reeds in the bog, Wozzeck sees mushrooms. Boesch sings with rapturous, though strange beauty: to Wozzeck, the mushrooms are supernatural miracles. In his own inarticulate way, Wozzeck is an artist, who can intuit things others cannot see. He's loyal to Marie though she's not too bright, her emotional range limited to formulaic homilies. The snatches of pseudo folk song and the "jaunty" choruses are there for a purpose, but not, I think, to suggest pastoral innocence. Perhaps they are Berg's way of saying that "romantic" escapism is a form of servility which fools "poor people" into accepting their lot. Berg's writing is too precise, and structured so deliberately that the strictness of the symmetry is very much part of meaning. This music operates like an invisible mechanism, controlling the narrative just as circumstances control the people trapped in the isolated garrison. Hence the tight discipline of Stenz's conducting. The Radio Filharmonisch Orkest play dance with tense, bristling energy. Marches and dances are exercises in formation. Let the momentum slip and things fall apart. 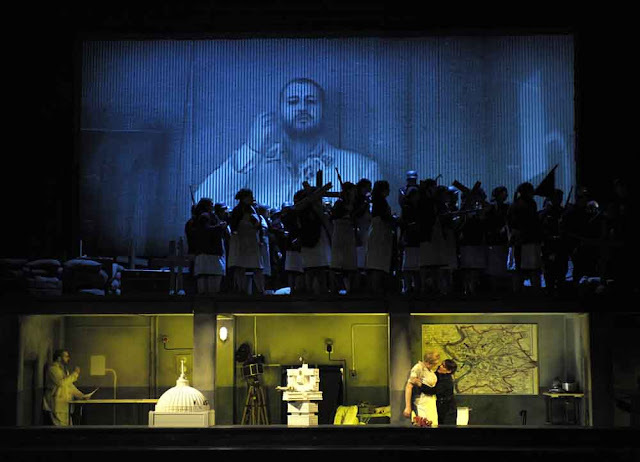 Boesch and Stenz first did Wozzeck together in 2011 in Cologne, from which the photo above was taken (copyright Bernd Uhlig) so there's an electricity between them that animates this concert performance so it feels like drama. The dynamic is so strong that I hope they'll be doing further full productions. In Amsterdam last week, Nathan Berg sang the Doctor, a role he's done before and does extremely well. Berg's voice crackles with menace. His words may seem rational. The character clearly is not. Thomas Piffka sang the Captain, Asmik Grigorian sang Marie, Endrik Wottrich the Drum Major and Peter Tantsits Andre. Also available at the moment is Wozzeck from Zurich, conducted by Fabio Luisi with Christian Gerhaher in the title role. Last October, Luisi brought this to London in concert performance, with Leigh Melrose stepping in. Please read my review here. . Luisi was new to Wozzeck, but conducted brilliantly: proof that technical excellence allows great freedom of expression. The Zurich production has a very good cast (wonderful Doctor/Captain) and a much better Marie) but the staging doesn't help. In principle, the idea is OK : a puppet theatre with the singers as puppets. In practice, that means wooden acting. The singers become caricatured stereotypes. Gerhaher in particular becomes a cipher. Gerhaher in particular becomes a cipher, the portrayal too anonymous to compensate for a voice which is a bit of the generic side for a role as quirky as Wozzeck. The Aldeburgh Music Festival epitomizes Britten's belief that life, art and landscape connect, and this year's festival is particularly innovative. 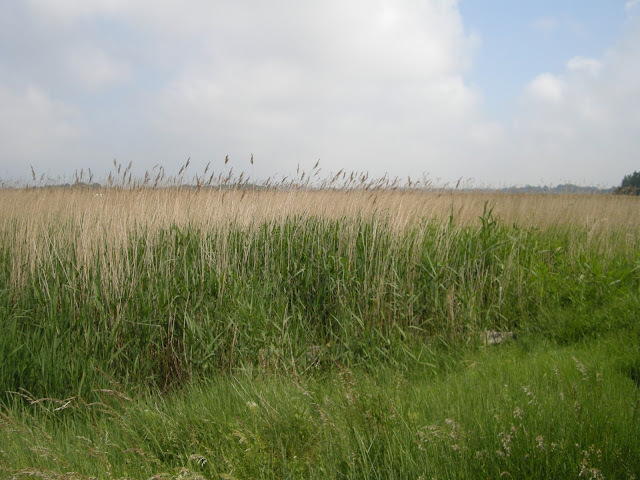 Pierre-Laurent Aimard will take his music outdoors, into the reedbeds that surround Snape and start playing in darkness at 430 am. In the darkness, the landscape may seem still, but the reedbeds come alive with birds, for this is Minsmere, one of the finest nature reserves in this country. Olivier Messiaen's Catalogue des Oiseaux is a magnum opus of 13 substantial movements, spread over 7 books, and takes nearly three hours to play. It isn't something you'd hear often in recital. Messiaen himself woke before sunrise, waiting in the darkness for the dawn chorus when birds call out to mark sunrise. This Catalogue des Oiseaux will unfold in stages throughout the day of 19th June, ending around midnight when the birds go to rest. The music will be heard, literally, in context, even if the birds at Minsmere aren't the same as those in the Camargue, where Messiaen heard them, but the event will be "music theatre", music heard with added value. Aimard is, without doubt, the greatest exponent of Messiaen's works for piano, so this will be the experience of a lifetime. Please also read my piece on Aldeburgh's Les Illuminations - Britten illuminated. Benjamin Britten goes to the circus ! And why not ? 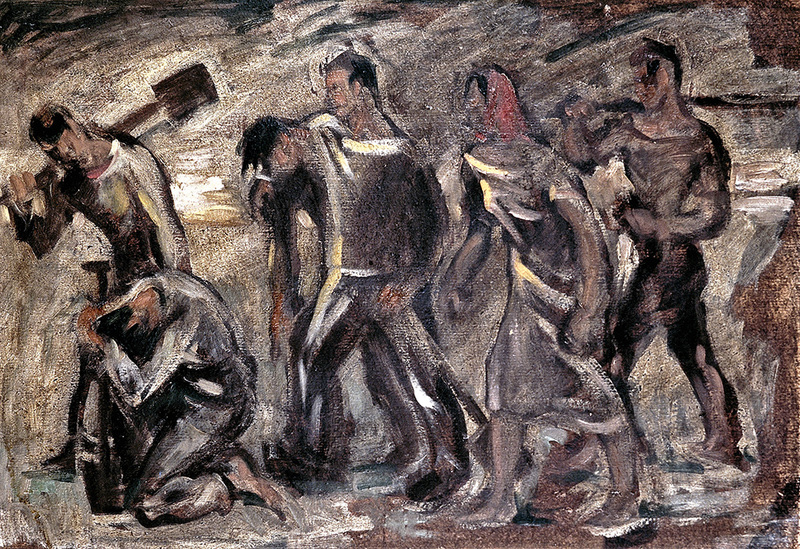 Rimbaud's original is much longer but Britten's setting emphasizes its theatrical aspects. Les Illuminations is a watershed in Britten's creative growth because he was finding his own, individual voice through what Auden was to call "mediterraneanising" - breaking away from the conventional world of a mainstream British composer. Britten's horizons looked outward to the North Sea and beyond. He adored Alban Berg and would have been well aware of Lulu, where characters flit from persona to persona, and where proceedings are overseen by a Ringmaster. Perhaps it's no accident that he responded to ever-changing circus in Les illuminations and it's keynote cri de coeur "J'ai seul la clef de cette parade sauvage!" It's not a cry of triumph but the realization that the key - the illumination - to creativity lies in being genuinely original. Roderick Williams and Susie Allan gave the world premiere of A Swift Radiant Morning commissioned for theThree Choirs Festival. Listen here, because it's an interesting work that extends the canon of British song. "A swift radiant morning" aptly describes Charles Hamilton Sorley, a young man of outstanding promise, killed by a sniper at Loos, seven months short of his 21st birthday. At that age, few fulfil their potential, but C H Sorley must have been quite a personality. In this photo he stares at the camera without flinching, unfazed by the knowledge that he was going to war. We can see why Sorley's father said "he looked upon the world with clear eyes , and the surface did not deceive him". Sorley was in Trier when war was declared in 1914. On his return to England, he did his duty and joined the Suffolk Regiment . Yet in his poem To Germany, he writes of war with maturity way beyond his years. The poem is worth reading because it shows his inner strength. He could resist the hate games around him. This lucid intelligence marks him out as a person with vision. Notice too his direct, yet highly distinctive, way with words. How he would have relished the freedoms of the 1920's and 1930's. Many good poets were destroyed by war - Wilfred Owen, Edward Thomas, Isaac Rosenberg and Ivor Gurney, but John Masefield said that Sorley was the greatest loss. In A Swift Radiant Morning, Rhian Samuel (b 1944) sets two poems and four texts by Sorley, which has a bearing on her musical conception. Sorley left only 37 complete poems, but a large body of letters. They make fascinating reading, since Sorley was an acute observer and processed ideas with great originality. Here's a link to the full collection of letters published in 1916. Letters are like a conversation, where one party speaks and the other responds. The voice leads, but the piano comments, unobtrusively. Sorley's texts are so expressive that the piano can't quite compete, but that's no demerit. Samuel respects Sorley's syntax and turns of phrase, editing the longer texts with sensitivity. Roderick Williams is an ideal interpreter, since he has the uncanny ability to make what he sings feel personal and direct. A natural match for CH Sorley ! At times, Samuel forces the voice above its natural range. Williams manages extremely well, but I wonder if this cycle could be transposed for tenor. A Swift Radiant Morning is a well-crafted, sensitive work which deserves attention, and not just because the subject himself was so singular. I've subscribed to a source which features a lot of Rhian Samuel's work. Lots worth listening to. At Hereford, Roderick Williams and Susie Allan also did Tim Torry's The Face of Grief (2003) to poems by Charlotte Mew (1869-1928) but the setting is minimal and the poems not in the same league as Sorley's. Please also read my piece on the rest of Roderick Williams's recital, which highlighted Elgar's Sea Pictures, in the piano version, transposed for baritone. Mark Elder and The Orchestra of the Age of Enlightenment marked its 30th anniversary with Carl Maria von Weber Der Freischütz. A good choice, since Der Freischütz is a milestone in music history, and represents a turning point, too, in wider European cultural history. Der Freischütz is the embodiment of Romantic ideals. In effect it marks the beginning of the modern era. So what if English-language listeners don't know the work as well as they should? Without Weber, music, not just opera, might not be as we know it today. No Der Freischütz, no Wagner, no Berlioz, no Schumann, no Mahler. Parochialism is no excuse for not knowing music or even basic world history. 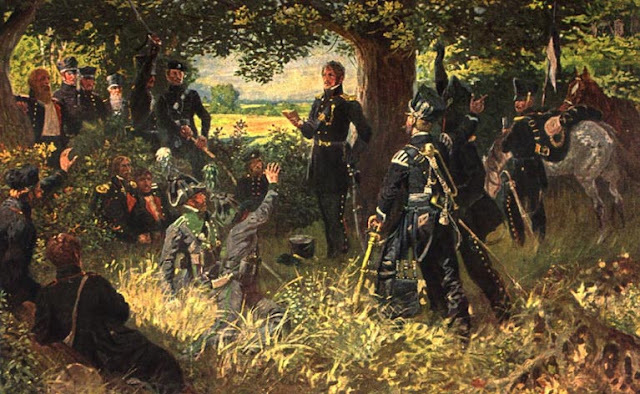 Der Freischütz was first performed in 1821, just seven years after Napoleon's defeat. Many in the audiences in early performances would have had direct personal experience of the wars and their impact on German-speaking lands. Romanticism has nothing to do with being "romantic" in the modern sense of the word Its ideals galvanized European thought, especially in Germany which hitherto had been a diverse conglomeration of 300 states. This period saw the growth of solidarity between German-language speakers, whatever their region. Nationalism then was a progressive, unifying force. This interest in the past wasn't about the past but a way of using the past to validate new ideas like national identity and the role of the individual. Thus the interest in German folklore, in Brentano and von Arnim's Des Knaben Wunderhorn, in the poetry of Gottfried Herder and even the concept "Gedanken sind Frei" (Read more here) the individual as opposed to mass authority. From the Romantik sprang the revolutions of 1848, all over Europe, not just Germany. Understanding this context is fundamental to appreciating Der Freischütz. Der Freischütz portrays an idealized vision of the German past, where hunters provide sustenance and live (more or less) in harmony with Nature. But remember that forests can be dangerous places. Not for nothing are they a symbol of the unknown, and of the unconscious., Read Simon Schama: Landscape and Memory (2004), Jeffrey Wilson The German Forest (2012). And, for that matter Bruno Bettelheim's The Uses of Enchantment. Disney sanitized our appreciation of fairy tales as folk psychology, and infantilized meaning. Absolutely resist the idea that Der Freischütz should either be sentimental or kitsch. The people in this opera inhabit a world where danger and loss is never very far away. Max, a humble junior huntsman, wants to marry Agathe, the boss's daughter, but in this rigid, hierarchial society he has no chance of challenging the social order. To win Agathe, he has to do a deal with the Devil whom Samiel represents. If Max escapes in the end, it's only because Caspar pays the price and Prince Ottokar intervenes as deus ex machina. It's a near thing. Agathe could have been killed and Max executed for murder. Weber's music is exquisitely beautiful, as if it were, like the magic bullet, deflecting truth from those who can't handle reality. Magic Bullets are not a solution. indeed, this opera can even allude to the dangers of quick-fix nationalism. Remember Hermann Göring if you think productions should be twee and folksy. Who was Göring in league with? Hunting parties have long been a part of European culture, so they aren't in themselves any big deal. Read my piece here why the French Der Freischütz matters. It translates perfectly well to a non-German context. When we listen to Weber's hunting horns and rousing choruses, we should think about what's being hunted, and why. The music is ravishingly beautiful because it emphasizes the beauty of life. But killing is a bloody business, it's not pretty and it's not sentimental Stick to Disney if you can't cope. Weber's audiences would have known all about the Lützower Freikorps and other volunteer units who took to the forests and fought Napoleon's armies in guerilla action. Most of these men were urban intellectuals, some aristocrats, some artists. Some of Schubert's friends and poets were among their number. But all believed in liberty and the ideals of the Romantic movement. For me the most rewarding recording is Carlos Kleiber because it's savage and Max (Peter Schreier) is wonderfullly manic. Williams started with RVW Four Last Songs. Divest oneself of notions of Richard Strauss. RVW's songs aren't nearly such masterpieces, but a loose compilation of ideas left unfinished upon the composer's death. Procris is based on a poem by Ursula Vaughan Williams, Menelaus on the Odyssey. The last two last poems are more personal .The contemplative mood of Tired suggests a man assessing his past without rancour, and Hands, eyes and heart suggests inward, private emotions. Stylistically, they connect more to very early RVW, even pre-Ravel RVW, than to his finest works, but are still worth hearing, especially for English song specialists. I first heard them from the Ludlow English Song Weekend in May 2015. Elgar is an essential feature of the Three Choirs Festival, which this year takes place in Gloucester. But large-scale Elgar, rarely Elgar piano song. Again, Roderick Williams to the rescue ! Elgar's Sea Pictures is usually heard with full orchestra, though Elgar himself transcribed the piano song version, and played it privately. Elgar's art songs are somewhat eclipsed by the fame of RVW, Quilter, Butterworth et al, for in many ways they hark back to an earlier era. Sea Pictures, however, was conceived with grand orchestral flourish, so this version is rather more than Elgar's other songs for voice and piano. Sea Pictures is also mezzo and contralto territory, so hearing it with a baritone makes it even more unusual. Most of us are imprinted with memories of Janet Baker singing "Yet, I the mother mild, hush thee, O my child" but the mother figure in the poem fades as the vision of Elfin Land emerges. The lower tessitura suits the last strophes, where "Sea sounds, like violins" lead the descent into slumber. The maritime references in Sabbath Morning at Sea become more prominent: most sailors in Elgar's time were male, after all. The piano part in this song is distinctively Elgarian. When RW sings "He shall assist me to look higher", you can almost feel the ship's sails billow in the wind. A male voice works best with The Swimmer and its muscular, athletic swagger: very macho. A pity that the BBC miked the piano too closely. When I heard Williams sing Sea Pictures in recital at the Oxford Lieder Festival with Andrew West five years ago, the balance was much more natural. Mahler Symphony no 2 with the London Symphony Orchestra, conducted by Daniel Harding, at the Barbican, London, with soloists Miah Persson and Anna Larsson. 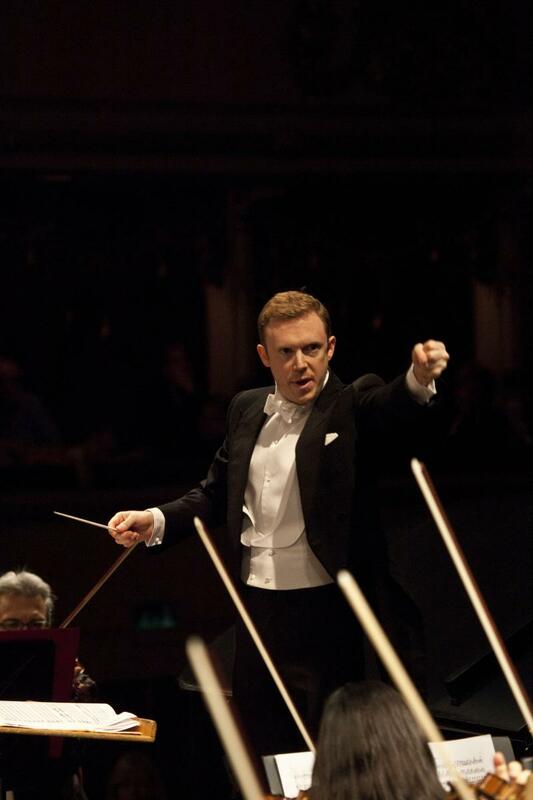 Harding has been Principal Guest Conductor with the LSO since 2007, alongside Valery Gergiev as Chief Conductor. Both men have done almost complete Mahler cycles with the LSO, though their approaches to Mahler are very different indeed, which can be a good thing, since that stimulus keeps an orchestra on its toes. Gergiev's Mahler was loud, extremely effective in the bombast of Mahler's First Symphony There's loudness in Mahler's Second too, but the composer is fast maturing. I've heard many Mahler 2 performances fall apart when conductors assume that noise is an end in itself. Fortunately, Harding understands context. Extreme dynamics are a feature of Mahler 2 and must be observed. In the Barbican Hall, however, allowances must be made for the acoustic of a hall where horizontal space is greater than depth, at least in the stalls. (I was in row P by aisle, optimal position). Harding and the LSO know the Barbican well enough that they don't need volume for effect. The first crashing chords exploded vigorously, but swiftly moved on. Mahler's markings state"mit durchaus ernstem und feierlichem Ausdruck", with serious and solemn expression". Mahler was musing on the funeral of Hans von Bülow. This first movement is a funeral rite, a formal procession which progresses in stages towards an inevitable conclusion. In this performance, what came over well was a sense of dignity. If some of the playing, particularly in the brass, was somewhat awry, it didn't greatly detract, when some great person passes away, there "is" something wrong. When Harding conducted this symphony with the Swedish Radio Symphony Orchestra where he's Chief, in 2014, I wrote that "he emphasized the inherent tension between forward-reaching lines and tight staccato, suggesting that a powerful transformation is underway even in the presence of annihilation.... The pastoral woodwinds might suggest happy memories of the past. Quiet, purposeful pizzicato, like footsteps, lead into savage brass climaxes, creating the sense of hard-won stages on a difficult ascent. Perhaps we can already hear the 'mountains' in Mahler's Third Symphony, rising ever upwards." The Swedes were playing a mega high profile gig at the Proms. the LSO doing yet another concert at the end of a long season. There's no real comparison, but enough was still in place that we could appreciate what Harding was doing. Last week, Harding conducted Mahler Symphony no 4 with the Orchestre de Paris at the Philharmonie (please read my review here); he demonstrated the way that symphony fits in with the wider traverse of Mahler's symphonies as a whole. The LSO and the Orchestre de Paris are very different orchestras, but we could hear the underlying concept unfold. The Luftpause marks a transition, after which we move to the freedom of the next movements. The Ländler passages, which seem to look back on a happy Wunderhorn past while also looking forward to the open vistas of the Third Symphony. The Des Antonius von Padua Fischpredigt section here was energetic. The forces of Nature don't change and carry on in their contrary ways, whatever mankind might dictate. And from this wayward rebellion thus the sudden contrast thatb happens with the song O Mensch, and the cataclysmic fanfare that followed, driving away doubt in a blinding glare of light and sound. In the Barbican, the offstage trumpets are very effective, because they are relatively close to the main orchestra, into which they faded. Well poised pizzicato "footsteps" moved forward, no longer in funereal procession but with sprightly verve. Then "funeral" sounds return in low brass, basses and strings, for we're still proceeding, hurriedly, towards the big climax, almost literally the "last trumpet" from above the stage, and to the flute which might represent the pipes of Pan. Raptly reverential singing from the London Symphony Chorus (Leader Simon Halsey), Anna Larsson and Miah Persson who are a regular team in this Symphony. Once, they rescued a particularly formless performance (not Harding and LSO), because they knew what they were doing and the rest of the crew followed them. Mikko Franck conducted Mahler Symphony no 3 with the Orchestre Philharmonique de Radio France last week in a striking performance which filled the basilica of Saint-Denis "de toute sa majesté." (video here) A majestic performance to match majestic surroundings, even if the fixed camera positions don't do the film justice. (audio only here). This is a superb performance: someone I know was actually present at Saint-Denis, and even more enthusiastic ! A magnificent reading, where the craggy "peaks" in the landscape loom darkly over sunlit meadows. Both aspects of the symphony are fundamental to meaning. I've listened to this so many times over the past week that I'm too exhausted to write as much as I usually would A bit stunned, too. From the get go, Franck's approach is masterful. He knows what the OPRF can do, and pushes them. The intensity of the first theme feels dangerous, not violent but uncompromising. When the next theme enters, the pizzicato dances brightly : sparkling sunshine ? moments of happiness ? Franck doesn't linger, pushing ever forwards, so the expansive figures which follow seem exuberant. Mahler's music is striding forward as the composer himself did in the mountains of the Salzkammergut. Hence the gloriously open vistas, the horn and trumpet calls. Then, suddenly dark moments return and the horn calls more poignant, the violin melody delicate. But flurries on winds and strings whip along, as energetic as mountain breezes. "Pan erwacht: Der Sommer marschein ein" This long first movement can baffle, but Franck observes its structure, intensifying the sense of forward thrust. There are marches, here, yes, and part way the orchestra breaks into a wild gallop. But these aren't "military" marches even when the drums roll. The brass theme returns again, triumphant : Pan was the God of Nature, of music and significantly of disarray. But it would be amiss to approach this symphony in sloppy disarray. This orchestra is so good that Franck's tight discipline spurs them on. Another visual metaphor : the energy of many stallions coming purposefully together. Us modern, urban folks don't remember why "horsepower" is a measure of an engine's power. Listen for that cracking ending ! The second movement here is purposeful too. No lazing in the sunshine here. Listen to the sharp, crackling percussion chasing the orchestra on, and later the woodwinds. Franck gets good interplay between nostalgia and excitement : one without the other wouldn't be quite so piquant. The violin melody is exquisite. Yet immediately the mood is cut by Dionysian swagger. Summer rushes forth with unstoppable vigour - listen to the brass repeat the birdsong, but with sass and rude health. Kukuk ist tod, kukuk ist tod - but not for the moment! Summer is short in the mountains, as the lingering call of the distant brass reminds us. But while it's here it's glorious. Thus the posthorn call, heard from a distance, as if it remains suspended in time. The world may change, but somehow the posthorn is eternal. Mihoko Fujimura has been singing Mahler for years. Here, she's magnificent : elegant yet austere and dignified. Voice and violin dialogue : the rest of the orchestra seems stilled, listening in rapt concentration. For all the abundant life in the orchestra up to this point, we're hit hard by the inescapble fact : things come to an end. We're not left there long, though, as the Choir of Radio France sparks into action. Bimm, Bamm, Bimm bamm. Notice the regular rhythm, her "march of life quietly resurgant. Another ;long, poignant look backwards. Wonderful violins, their soaring tessitura suggesting upwards movement. Perhaps in Mahler's time, orchestras weren't so technically proficient but that's no excuse. Mahler's music is so beautiful, so wonderful that it really needs performers who can access levels the composer might have dreamed of. +As the symphony moves into its last, all-important themes, refinement is of the essence. We are no longer in the mountains, even as metaphor, but in an altogether more elevated, spiritual plane. Magnificntly assured playing. Now the "march" is beaten out firmly on timpani, with quiet confidence that doesn't need overstatement. und ziehen mit dem Spaten ins Moor. Wir sind die Moorsoldaten und ziehen mit dem Spaten ins Moor." No "news" at all that Yannick Nézet-Séguin has been named next Music Director of the New York Metropolitan Opera. The real news is: what the Met wants from a Music Director. What YSN is as a conductor has little relevance in comparison to what he could or couldn't do for the Met. Fortunately there are a few observers who think beyond the headlines. The main piece in the Guradian is the usual vacuous blather, but buried within is a much more thoughtful article by Seth Coulter Walls. Read it HERE. It chokes me to agree with Anthony Tommasini but his piece "Is YNS worth the wait for the Met" does raise valid questions. Alex Ross joins in too, but assumes that what the Met needs is modern repertoire. YSN isn't the man for that, whatever his merits. The real issue is what an opera Music Director does and what any appointment portends for the longer-term future. Given the situation at the ENO, it's relevant in the UK too. Beefcake doesn't hurt. A Music Director is a figurehead, a walking corporate logo. YSN could boost audience figures without even raising his baton. Big plus there for the Met! Antonio Pappano is worth his weight in gold for the Royal Opera House because he is a genius communicator. He makes great TV documentaries which anyone can enjoy, without dumbing down. His enthusiasm is infectious because it's genuine, not the product of marketing or PR. He's motivated by love, as many driven personalities are. That's why they're good at what they do. YSN doesn't need to be as flamboyant as Pappano (who is unique) but the Met would be wise to make the most of him other than as a conductor. But there's more to a good Music Director than image. Mark Wigglesworth was a brilliant choice as Music Director for the ENO because he actually knows about music. Gasp, shock, and horror in times when you can head the ENO, the Arts Council England and BBC Radio 3 with minimal relevant experience. Wigglesworth still conducts the ENO but now policy is made by those whose primary interest is being paid by the piper not playing. Strictly speaking, a Music Director is also an Artistic Director as he or she represents artistic conscience. Vision matters. Read my piece Solutions for the ENO vision not pettiness. The same principles could apply anywhere, even to the Met. Understand the house's place in the arts community and wider economy. There's so much international competition that no house can operate in isolation. Only amateurs think short term. A successful house depends on a healthy mix of cultural and business savvy, and the ability to think ahead. Without leadership, any business, of any kind, eventually fossilizes. The Met's problems began long ago, even before James Levine, but eventually someone has to take charge, Music Director or not. What the Met, the ROH and the Berlin Philharmonic have done right is to acknowledge the way technology opens new markets. "Bums on seats" isn't the way the business operates any more. Yannick Nézet-Séguin's name sells (even though it's hell to spell) so he will make a difference. So he conducted a good Carmen? That's Carmen, for goodness sake! Much as I love Carmen, there's more to opera than that. The new market technology brings can mean many things. Perhaps it can spread the market reach of more esoteric fare. 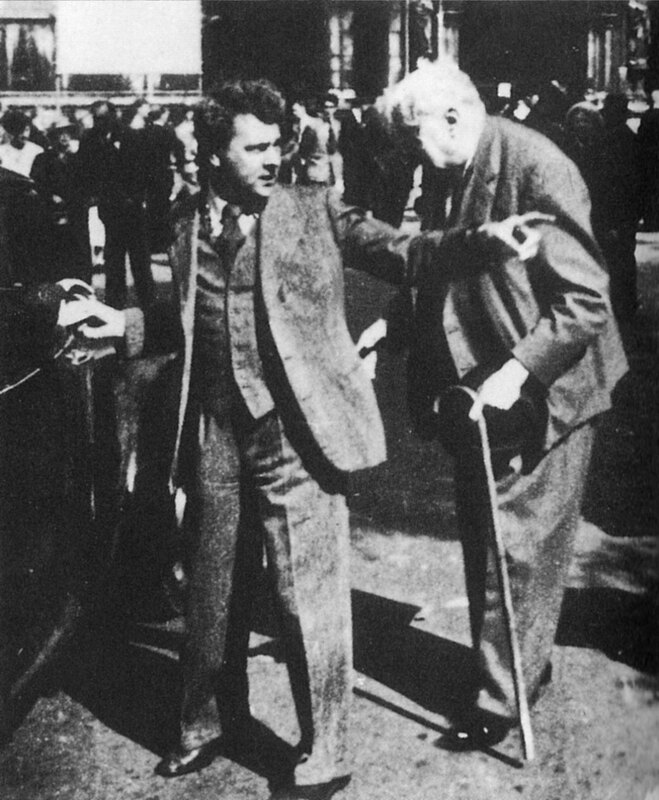 The ROH, for example, has brought Szymanowski and Enescu to the world. But mass markets can also mean a downgrading of artistic integrity. Under pressure to sell at any costs, will houses sell out in every sense of the term? A good Music Director needs to keep his house on the ball at all times, not just when he's conducting. YSN is a good conductor, though challenge isn't really his thing. He hasn't said much, which is fair enough, but at least he's not saying things like "let's do musicals" as the new ENO Artistic Director has been reported as saying. But eventually a Music Director has to have a point of view or the product doesn't shine. The Met has sailed on rudderless for ages and may well sail on forever. Maybe the flags that are flying read: "Don't rock the boat....yet."